The Obama administration, forced to defend its practice of placing families in immigration detention in court and from political opposition, may now have little choice but to fundamentally alter the policy. Though conceding earlier this summer that substantial changes to detention practices were necessary, the government argued against an August court ruling that could result in the release of up to 1,400 unauthorized immigrant women and children. The decision has heartened critics who see the detention of immigrant families as ineffective and inhumane. The current detention controversy has simmered since summer 2014, when the administration responded to the arrival of tens of thousands of Central American mothers with children at the U.S.-Mexico border—many fleeing for humanitarian reasons—by significantly expanding family detention capacity. On August 21, in a critical legal development, federal District Court Judge Dolly Gee of Central California ordered the Department of Homeland Security (DHS) in Flores v. Lynch to begin releasing from immigration custody children and their accompanying parents. This followed the court’s July 24 ruling that a 1997 settlement, Flores v. Reno—which initially set standards for the release, detention, and treatment of unaccompanied children in federal immigration custody—also applies to accompanied minors, or those apprehended with a guardian. Under the settlement’s terms, children must be released from detention “without unnecessary delay” to a parent, relative, or other guardian in the United States, and when in detention, held in the least restrictive setting in nonsecure facilities specially licensed to care for children. Judge Gee found that DHS’s practice of holding families in detention for long periods violates that settlement. She also ordered DHS to improve the “deplorable” conditions in Border Patrol stations, where children and families are often initially held for several days. Judge Gee gave DHS until October 23 to comply with her August order, and denied the government’s request to reconsider her July ruling. The Justice Department is considering whether to appeal the release order. Meanwhile, DHS has said it will continue to detain families apprehended at the border, as the order provides for an exception during periods of heightened child migration. Unlike detention in the criminal-justice context, immigration custody does not have a punitive function, but is designed to ensure that immigrants appear at their hearings and/or can be successfully deported after a final order of removal. The government’s justification for family detention has also hinged on its importance as a deterrent to illegal immigration. This reasoning was dealt a legal blow in February, when a federal court in the District of Columbia prohibited invoking deterrence as a justification for detaining Central American families apprehended at the border. The ruling prompted a series of policy reforms: In June, Homeland Security Secretary Jeh Johnson announced that families who initiate an asylum claim could be released on bond, and that screenings for humanitarian claims will be conducted within a shorter timeframe. The announcement built on similar initiatives unveiled in May that established periodic reviews for families detained longer than 90 days to determine the continued appropriateness of detention. The administration now says that most families are being released within about two weeks, and that DHS has stopped using general deterrence as a factor in detention decisions for families who have applied for asylum. Further chipping away at the policy, several other lawsuits have been filed alleging substandard conditions and lack of access to medical care in family detention facilities. While the detention and treatment of families in immigration custody have been thorny issues for the federal government for many years, it received sharp new attention in the wake of last year’s child and family migration surge. The wave started in the spring of 2014, when tens of thousands of unaccompanied children began appearing at the U.S.-Mexico border (see this Policy Beat for more on the surge); by June, historically high numbers of Central American migrant families also began arriving. In fiscal year (FY) 2014, the Border Patrol apprehended more than 69,000 unaccompanied children and 68,000 family units, compared to 38,000 and 15,000, respectively, in FY 2013. Although public and press attention centered on unaccompanied children, the steepest increase was in mothers and young children. Unlike most migrants caught illegally crossing the border, who are detained for short periods before being deported, children and families who arrived during the surge were neither detained nor quickly deported. Both groups (unaccompanied children under statute and family units under long-standing agency policy) were instead released and issued a notice to appear in immigration court, typically on dates one year or more into the future. Many observers saw this policy as a magnet drawing further illegal family migration. In an effort to stem such future flows, DHS orchestrated a public relations campaign in Central America declaring that families arriving at the border would be detained and sent home. Backing the warning, DHS rapidly expanded its family detention capacity from fewer than 100 beds in early 2014 to more than 3,000 as of September 2015. While the initial goal of large-scale detention was to briefly detain and swiftly deport families, many women and children applied for asylum and have remained in detention for prolonged periods while their claims are processed. The expansion sparked an immediate backlash, gaining momentum throughout 2015 with Judge Gee’s rulings providing a critical legal boost. Child and immigrant advocates have called for an immediate end to family detention, arguing that it is morally deplorable and inherently psychologically harmful to young children and their parents. They also assert that the detentions have been unduly long, arbitrary, undermine due process, and limit detainees’ access to legal counsel. Many visitors to the facilities, including a group of lawmakers, have cited concerns that detainees lack access to quality health care, and are vulnerable to abusive treatment. The vast majority of families held in detention were in the process of applying for asylum, having fled gang or domestic violence in their home counties, according to a 2014 study by the Women’s Refugee Commission and Lutheran Immigration and Refugee Service. Asylum seekers are seen as an especially vulnerable population that pose little flight risk, do not threaten public safety, and are ill-suited for long-term detention. In a rare split with immigrant-rights advocates—a key constituency—the White House has staunchly defended the merits of detaining families, fighting in court to maintain the practice. Even amid mounting legal and political pressure, administration officials have argued that family detention is a necessary enforcement tool deterring illegal immigration, warning that its end could spur another wave of border crossers. DHS also contends that detention ensures individuals appear for their immigration hearings, and that the agency must adhere to its November 2014 guidelines prioritizing recent border crossers for detention and removal. Congressional Democrats have generally sided with immigrant advocates and are pushing for an end to family detention. Republican lawmakers, meanwhile, largely support the Obama administration’s position. Families arriving at the U.S. border are not a new phenomenon. Because they involve minors and oftentimes present significant humanitarian-protection concerns, immigration officials have struggled to determine appropriate policies for this population. Historically, most have been released pending adjudication of their cases in immigration court. Family detention was first introduced in 2001 when the Immigration and Naturalization Service (INS) opened the Berks Facility, a 96-bed family detention center in Pennsylvania. Amid the post-9/11 border security buildup, concerns arose that illegal border crossers were bringing along children—thought in some cases not to be their own—to ensure they would be released, leading DHS to more frequently detain family units. Initially, the families were separated, with children placed in Office of Refugee Resettlement (ORR) custody and their parents in standard Immigration and Customs Enforcement (ICE) facilities. In 2005 however, Congress intervened and directed DHS to detain family units together. In response, the agency in 2006 opened the 512-bed T. Don Hutto Family Residential Center in Texas. After a deluge of negative media attention, a campaign to close the facility, and litigation alleging prison-like conditions for children, DHS stopped housing families there in 2009. Berks Facility, however, has remained operational. The issue remained dormant until the influx of families, mostly single mothers with young children, arrived in 2014. Arguably, the curtailment of family detention after 2009 had left DHS ill-prepared to handle the surge. In an effort to stem the Central American flow and counter the perception that families would be released and permitted to stay, DHS quickly established a temporary 700-bed center in New Mexico in June. In August, 532 beds in the existing Karnes County Residential Center in Texas was converted for family detention use, and in November DHS opened the 2,400-occupancy South Texas Family Residential Center in Dilley, Texas. 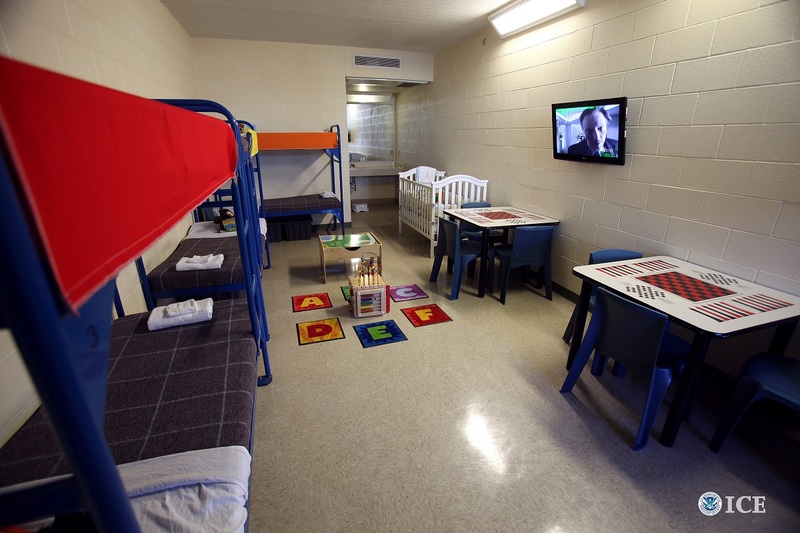 Two large industrial prison companies—The Geo Group and the Corrections Corporation of America—operate the new family facilities, generating concerns about conditions and oversight. This is complicated by the fact that under the 1997 Flores agreement, children may be detained only in facilities run by agencies with state licenses to care for children, not by private contractors. The heightened migration in 2014 demonstrated that the policy of when, which, and how family units should be detained remains highly unsettled. Unlike with unaccompanied children, Congress has barely touched the issue, prescribing no major policy framework. And although ICE issued family detention standards in 2007 setting minimum requirements for security, education opportunities, medical care, and recreation, the standards are not codified by regulation and thus could be altered by a future administration. They also do not address which families should be eligible for release. Given the opposition’s political and legal momentum, the policy of holding families in immigration detention is now in doubt. The recent court rulings have made it increasingly difficult for the Obama administration to justify the practice. And as the 2016 presidential election approaches, the White House will face increasing pressure to respond to the demands of immigrant advocates, many of whom are important constituents of the Democratic Party. If family detention is significantly curtailed, ICE will turn to broader use of alternatives to detention such as mandatory check-ins with detention officers, telephone monitoring, GPS monitoring, or use of ankle bracelets, approaches that some immigrant advocates have favored in the past. Their effectiveness in ensuring that immigrants in removal proceedings appear for their hearings, and in preventing another family immigration surge will be prove to be critical. If successful, the practice of family detention may be minimized in the long term. If not, it could underscore the need to maintain the controversial policy of large-scale family detention. Although the peak migration of 2014 has abated, the number of migrant families arriving at the Southwest border continues to significantly exceed historical norms. They may represent a lasting border-enforcement challenge for the future, testing not only the role detention policies play in immigration enforcement but also the additional policies needed to meet the United States’ dual commitments to border control and humanitarian concerns. United States to Admit 10,000 Syrian Refugees. On September 10, the White House said the United States would admit 10,000 Syrian refugees in fiscal year (FY) 2016, which begins October 1, 2015. The number represents a significant increase from the FY 2015 quota of 2,000. The United States has faced increasing pressure to respond to the recent escalation of the refugee crisis in the Middle East and Europe. Thousands of asylum seekers are arriving daily in Europe with more than 411,000 migrants arriving by sea this year, according to the United Nations High Commissioner for Refugees (UNHCR). Most are fleeing violence in Syria, Afghanistan, and Iraq. UNHCR has already referred 18,000 Syrian refugees to the United States for resettlement. U.S. refugee processing, which involves rigorous background checks and interviews, takes about two years to complete. Obama Administration Announces Change to Visa Bulletin. On September 10, the State Department and U.S. Citizenship and Immigration Services (USCIS) announced changes to the monthly Visa Bulletin, which displays current immigrant visa availability information and indicates when statutorily limited visas are available for issuance to prospective immigrants based on their individual priority date. The changes will allow certain individuals in the immigrant-visa backlog to submit their permanent-residence applications early. The new bulletin will include two categories: an “approval” date indicating when immigrant visas become available and can be granted for each permanent immigration category, and an “acceptance” date (several years before the approval date) indicating when those in the backlog may submit their application for the final stage of the green-card process. Under the current system, applicants may only submit their green-card application when their visa becomes available. The change will significantly benefit individuals applying for adjustment of status from within the United States, as simply filing that application enables the primary applicant and derivative family members to apply for employment and travel authorization. Those who file early, however, will not receive their green cards until their approval date is listed on the visa bulletin. The change is part of a series of executive actions on immigration announced by President Obama in November 2014. Yemen Designated for TPS. The Department of Homeland Security (DHS) on September 3 designated Yemen for Temporary Protected States (TPS) due to the country’s widespread armed conflict and resulting severe humanitarian emergency. Eligible Yemeni nationals residing in the United States may register for TPS between September 3, 2015 and March 1, 2016. The designation will remain in effect through March 3, 2017. Authorized by the 1990 Immigration Act, TPS grants work authorization and protection from deportation to certain nationals of designated countries that are deemed unsafe for repatriation due to ongoing armed conflict or the effects of a natural disaster. Twelve additional countries are currently designated for TPS: El Salvador, Guinea, Haiti, Honduras, Liberia, Nepal, Nicaragua, Sierra Leone, Somalia, Sudan, South Sudan, and Syria. California Passes U-Visa Law. California state lawmakers have approved a bill to make it easier for individuals to apply for U-visas, a nonimmigrant visa for victims of certain crimes (such as domestic violence, sexual assault, and trafficking) who have suffered mental or physical abuse and are helpful to law enforcement in the investigation or prosecution of the offense. To receive a U-visa, an applicant must submit, among other documents, a “certification” signed by a law enforcement agency confirming their cooperation. However, the willingness of police agencies to sign such certifications has varied enormously across jurisdictions, with some eager to help and others resistant to processing the certifications. The California legislation intends to standardize the certification process and would require law enforcement to verify a person’s cooperation within 90 days of their request. Governor Jerry Brown has declined to comment on whether or not he will sign the bill. Federal Judge Dismisses SB 1070 Challenges. On September 5, a federal district court judge in Arizona dismissed the remaining challenges to Arizona’s 2010 omnibus immigration enforcement law, SB 1070, signaling an end to litigation over the measure. In 2012, the U.S. Supreme Court largely gutted SB 1070 but left a key, controversial provision in place that requires police to inquire into the immigration status of any individual who is arrested or stopped if they suspect the person is unauthorized. Opponents of the law have continued to challenge the remaining provision in lower courts on the grounds that it has resulted in racial profiling and is enforced differently for Latinos than for other racial or ethnic groups. The coalition of civil and immigration advocacy groups who brought the lawsuits have not indicated whether they will appeal the decision.